RIVERSIDE, CALIFORNIA (December 5, 2018) – 12 year-old Cody Kiemele of Riverside, CA will enter his second season of Junior Late Model competition in 2019, competing across the southwest in his #48 Unlimited Landscaping / Burgeson’s Air Conditioning Toyota Camry. The Amelia Earhart Middle School student burst onto the scene this season competing at Irwindale Speedway and the Bullring at Las Vegas Motor Speedway. 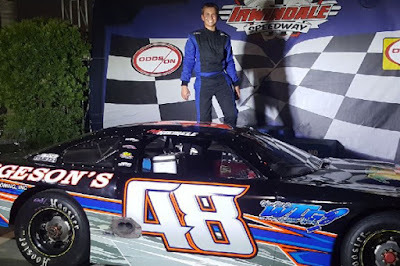 His progression into the series bore fruit, as he picked up two victories and three second place finishes at Irwindale on the one-third mile inner oval. He also accumulated a best finish of third at Vegas on the 3/8ths mile speedway. Kiemele was the fourth highest driver in the national points for INEX Bandoleros in 2017 and like many Bandolero drivers in the Southwest, he has taken to full-sized stock cars rather quickly. His season culminated with the biggest run of his career in November. Kiemele was granted an age exemption to compete in the $5,000 to win, 100 lap season finale at his home Orange Show Speedway in San Bernardino. Kiemele was one of three Jr. graduates in the field and he qualified eighth out of 18 cars. He drove a steady race for a fifth place finish behind fellow graduate Austin Herzog, 15, who picked up the win. The epicenter of the Jr. Late Model world is at Madera Speedway, which debuted the division for drivers ages 10-16 in 2016. Kiemele is working on his 2019 plans but they include starting the season at the MAVTV-televised one-third mile. The season opens on March 9th followed by round #2 on April 6th. Among the challenges will be an increase in lap count, with the Madera events spanning 70 laps. Drivers within the top-five at the lap 40 break receive a televised interview as do the top-three finishers at the checkered flag. Kiemele drives a GM 602 crate engine on a Pathfinder Chassis. He also divides his time as a baseball pitcher when not on the track. His sponsors include Swift Springs, Downforce Racing Products by Loren Hill, and DJ Safety. For more information or to sponsor Cody, call his father Rob at (909) 553-6130.